Anna Hamm Zacharias, daughter of Jakob Hamm and Aganetha Harder Hamm, was born at Lettelier, Manitoba on May 30, 1904. Her early years were spent at Morse, Saskatchewan and she was baptized in 1922 at the Herbert Mennonite Church. She married Franz R. Zacharias (1892 – 1981) in 1922. After they were married, they moved to Mexico for seven months. They returned to Manitoba where their son, Benjamin was born in 1923. They again moved to Mexico where their sons Levi (1925), Martin (1928), and Areli (1930) were born. The Zacharias family moved back to the prairies in 1931 and lived on a homestead at Meadow Lake where Martha (1933), Magdalena (1937), Hannah, and Leah (1944, twins) were born. Before 1947 they moved to Compass, Saskatchewan and in 1966 they moved to Herbert, SK. The Zacharias family attended the Church of God and the Emmanuel Mennonite Churches. After Franz died in March of 1981, Anna Hamm Zacharias lived in Winnipeg with her daughter Magdalena Putaro. She died in Winnipeg on December 23, 1985 and her funeral was at the Klassen Funeral Home. The personal papers relating to Anna Zacharias were donated to CMBS in January, 1986 by Mrs. Maggi (Luigi) Putaro of Winnipeg, Manitoba (daughter). The Anna Hamm Zacharias fonds consists of letters, diaries, funeral notices, crochet patterns, and genealogical material predominantly in the German Gothic script. The diaries are remarkable because Zacharias did not miss an entry between when she started writing in 1947 until she stopped a few months before her death. This fonds demonstrates what was of interest to a prairie farm woman in the mid twentieth century. Personal correspondence, mostly in the German Gothic script. – 1931–1984, undated. Assorted genealogical notes and clippings. – 1933, undated. Funeral notices and obituaries (alphabetical). – 1966–1985. 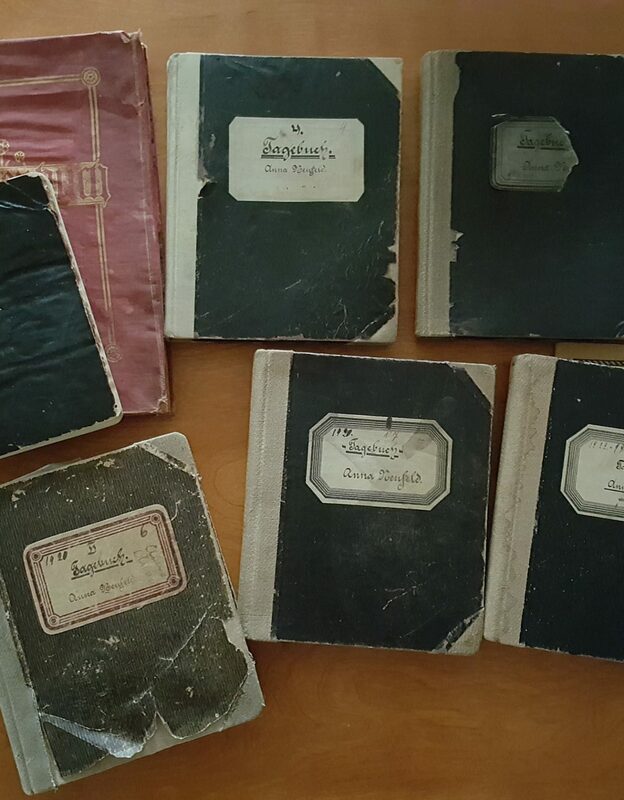 Small black notebook containing genealogical material. – Undated. A memory notebook containing birthdates from brother David H. Hamm. – 1901. Personal diary of Anna Zacharias, Compass, SK. – 1947–1951. Personal diary of Anna Zacharias, Compass, SK. – 1952–1955. Personal diary of Anna Zacharias, Compass, SK. – 1956–1961. Personal diary of Anna Zacharias, Compass, SK. – 1961–1965. Personal diary of Anna Zacharias, Compass, SK. until October 1966 and then Herbert SK. – 1966–1970. Personal diary of Anna Zacharias, Herbert, SK. – 1971–1975. Personal diary of Anna Zacharias. – 1976–1980. Personal diary of Anna Zacharias, Winnipeg, MB. – 1981-September 26, 1985.